Author(s): Ersilia Nigro, Aurora Daniele, Dipartimento di Scienze e Tecnologie Ambientali Biologiche Farmaceutiche, Seconda Universita degli Studi di Napoli, CEINGE-Biotecnologie Avanzate Scarl, Via Gaetano Salvatore 486, 80145 Napoli, Italy. Olga Scudiero, Maria Ludovica Monaco, Fiorentina Roviezzo, Bruno D’Agostino, Gennaro Mazzarella, Andrea Bianco. Asthma is a heterogeneous inflammatory airway disease, which exhibits multiple phenotypes, mainly defined by a combination of different clinical features. Asthma phenotypes include age at onset, smoking status, exacerbations frequency, and co-existence of obesity. Links between specific biological pathways and phenotypes are emerging. The genetic background together with detectable biomarkers could more accurately identify asthma phenotypes consistent with clinical-physiological characteristics and response to therapies. Several cross-sectional studies indicate a strict correlation between adipose tissue, obesity, and asthma suggesting that obesity is not only a risk factor for asthma but also a predictor of poor prognosis. Despite the strong clinical correlation between obesity and asthma, the underlying biological pathways have not been extensively investigated. Recently, a pivotal role for adiponectin has been recognized in physio-pathological conditions of lung. Adiponectin is expressed as a 247 residues long protein and secreted as oligomers of low, medium and high molecular weight. The larger oligomers seem to have a more pronounced insulinsensitizing, anti-atherogenic, and anti-inflammatory effects. Interestingly, the three receptors AdipoR1, AdipoR2, and Tcadherin mediating adiponectin activity are expressed on lung cells mediating adiponectin beneficial effects. Recently, different studies demonstrated the involvement of adiponectin in asthma since its levels and the expression of AdipoR1, AdipoR2 and T-cadherin are modulated in asthma patients and in asthma mouse models. In the present study, we review the literature reporting adiponectin impact on expression of specific clinical asthma phenotypes. Keywords: Adiponectin, adiponectin receptors, asthma phenotype, obesity. Affiliation:Dipartimento di Scienze e Tecnologie Ambientali Biologiche Farmaceutiche, Seconda Universita degli Studi di Napoli, CEINGE-Biotecnologie Avanzate Scarl, Via Gaetano Salvatore 486, 80145 Napoli, Italy. Keywords:Adiponectin, adiponectin receptors, asthma phenotype, obesity. Abstract:Asthma is a heterogeneous inflammatory airway disease, which exhibits multiple phenotypes, mainly defined by a combination of different clinical features. Asthma phenotypes include age at onset, smoking status, exacerbations frequency, and co-existence of obesity. Links between specific biological pathways and phenotypes are emerging. The genetic background together with detectable biomarkers could more accurately identify asthma phenotypes consistent with clinical-physiological characteristics and response to therapies. Several cross-sectional studies indicate a strict correlation between adipose tissue, obesity, and asthma suggesting that obesity is not only a risk factor for asthma but also a predictor of poor prognosis. Despite the strong clinical correlation between obesity and asthma, the underlying biological pathways have not been extensively investigated. Recently, a pivotal role for adiponectin has been recognized in physio-pathological conditions of lung. Adiponectin is expressed as a 247 residues long protein and secreted as oligomers of low, medium and high molecular weight. The larger oligomers seem to have a more pronounced insulinsensitizing, anti-atherogenic, and anti-inflammatory effects. Interestingly, the three receptors AdipoR1, AdipoR2, and Tcadherin mediating adiponectin activity are expressed on lung cells mediating adiponectin beneficial effects. 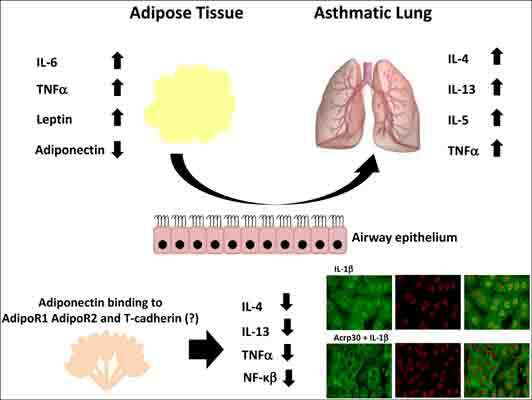 Recently, different studies demonstrated the involvement of adiponectin in asthma since its levels and the expression of AdipoR1, AdipoR2 and T-cadherin are modulated in asthma patients and in asthma mouse models. In the present study, we review the literature reporting adiponectin impact on expression of specific clinical asthma phenotypes.